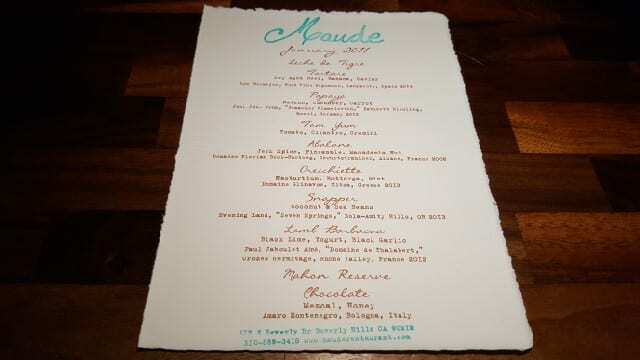 Curtis Stone opened the twenty-five seat Maude Restaurant in January of 2014. 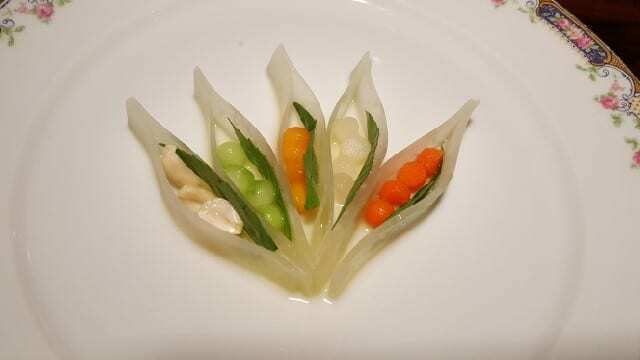 I was able to get my first reservation for March 2014 which featured artichokes. 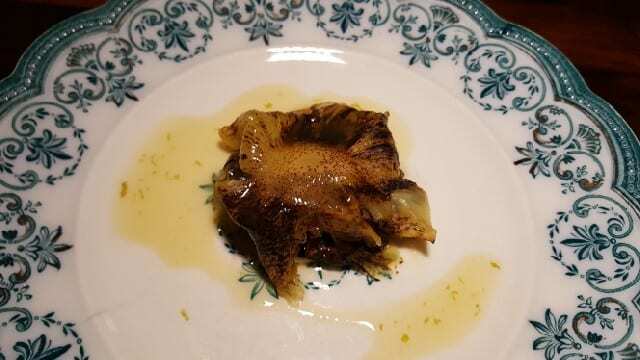 It was ten delicious courses in which artichoke was integrated into each dish, sometimes featured, other times less obvious. The experience was so unique and special that I was hooked. I went six times in 2014. Then in 2015, I went twelve times, every single month that year and was declared a Maude Superfan. In 2016, I went ten times, choosing to skip November and December when black and white truffles were featured (I had to give my credit card a rest). Here we are in 2017 and it is time for a new year of Maude meals. 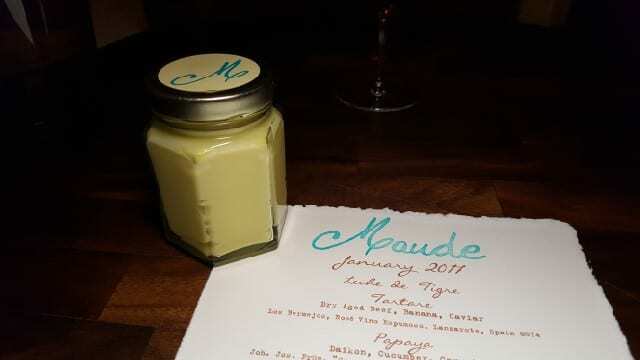 With the Maude team taking a much needed break, they started mid-January, offering the first menu for January and February. The theme for January/February is lime. I am known at the restaurant for taking photos of each dish and trying to carefully write down each ingredient, even though they give us a menu at the end of the meal. So, I decided that this year I would share the meal each month, really as a way to remember all of the amazing flavors of the dinner. 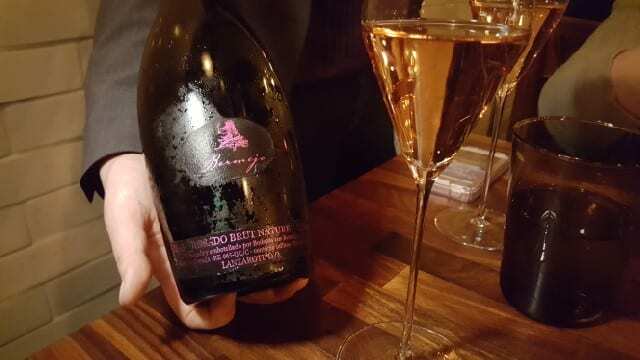 We decided to chose the wine pairing for this meal and started with the delicious sparkling wine from the Canary Islands, Los Bermejos Rose Vino Espumoso, Lanzarote, Spain 2014. Leche de Tigre – The Peruvian “tiger’s milk,” a citrus based marinade made with lime came with a surprise inside. After take a couple sips, we finished it as a shot. In the mouth it was both sweet and spicy with a mango sphere that bursts on your palate. 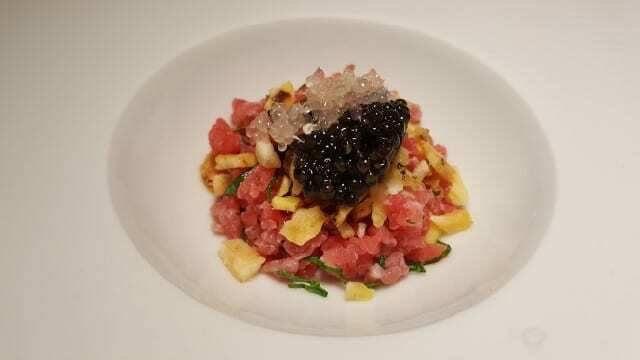 Tartare (20-day dry aged rib eye beef, finger lime, osetra caviar, banana puree, banana chips, bell pepper) – While it sounds like a weird combination, the flavors all work together. 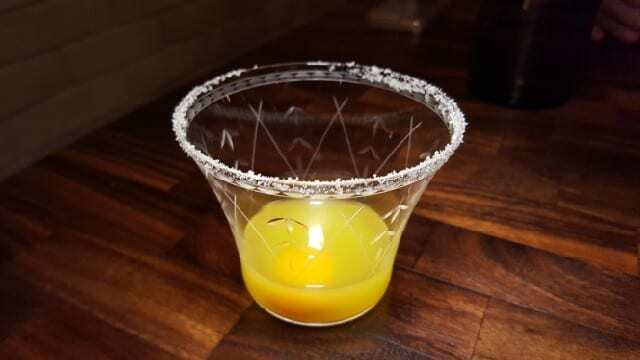 The banana puree is one of the first flavors but on the finish the lime and bell pepper subtly come through. The banana chips add texture to the dish. For the next two dishes, the minerally, slightly sweet Joh. Jos. 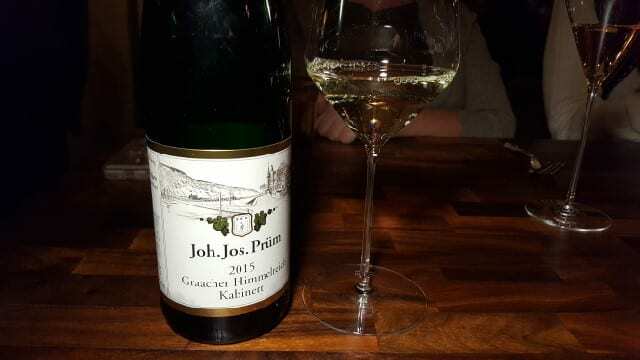 Prum Graacher Himmelreich Riesling Kabinett, Mosel, Germany 2015 was poured in our glasses. Papaya – Presented simply, yet artistically, on the plate, the salad of green papaya, daikon, carrots, cucumbers and peanuts, shines with a lime dressing. The sweetness of the wine brought out the sweeter notes of the dressing while diminishing the tartness of the lime. 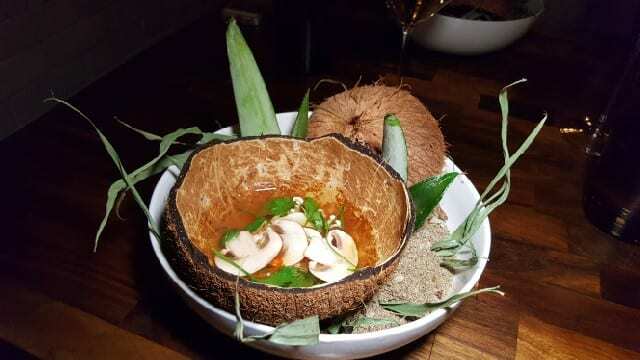 Tom Yum – Served in a coconut shell, the Tom Yum soup includes crimini mushrooms, fresno chilis, cilantro, silken tofu and lots of lime juice in a vegetable broth with just a touch of heat. I could have had seconds and thirds of the delicate broth but alas, it was just a small serving. 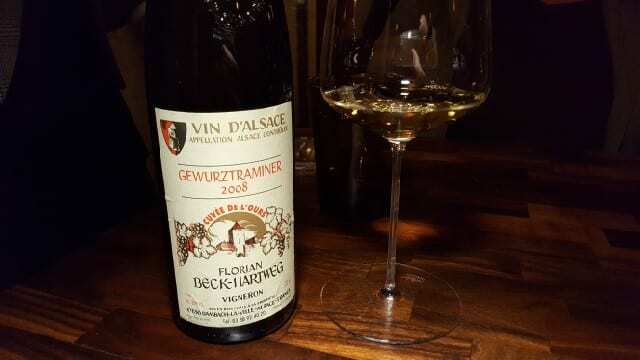 The Domaine Florian Beck-Hartweg,Gewurztraminer, Alsace, France 2008 was a beautiful golden color, showing the age of the wine, and had aromatics of white flower that jumped out of the glass. Abalone – The roasted flavors of the jerked spiced abalone, seared pineapple, smoked macadamia nut puree were so tasty in this dish that we were scraping up every little morsel on the plate. The next wine comes from Zitsa in the center of Greece and is made with the indigenous grape variety Debina. Domaine Glinavos Zitsa, Greece 2013 has delicate fruity aromas of apple, pear and fresh peach, minerality and good acidity. 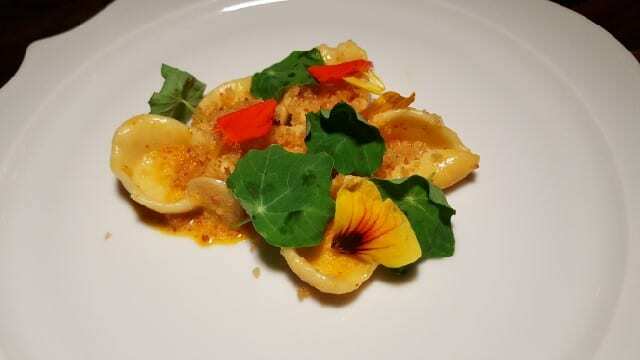 Orecchiette – The homemade pasta is served with bottarga, lime panko crumbs, nasturtium and mint. I loved the long finish of the citrus lime panko. The roundness and softness of the Evening Land “Seven Springs” Eola-Amity Hills, Oregon 2013 was perfect for the next dish. Snapper – Tai snapper is pan roasted with sesame oil and wrapped in caramelized cabbage, coconut nage, sea beans and dehydrated lime. This was another dish that I wished I could have had a second helping. 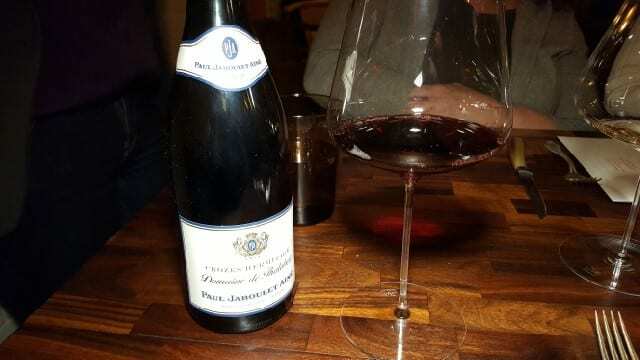 While lime generally pairs better with white wines, for the meat course we enjoyed the Paul Jaboulet Aine “Domaine de Thalabert,” Crozes Hermitage, Rhone Valley, France 2012. 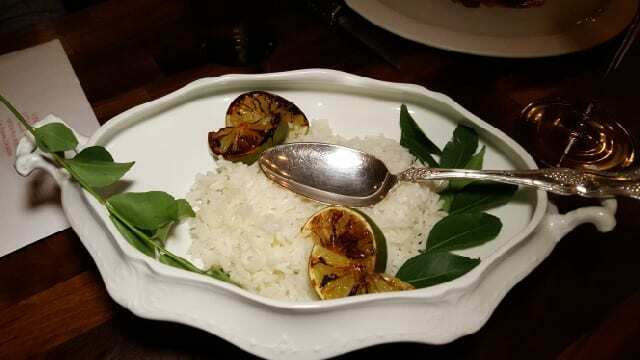 Lamb Barbacoa – Different cuts of lamb (tenderloin, belly, heart and liver) is prepared with black lime, yogurt and black garlic and served with lime flavored basmati rice. 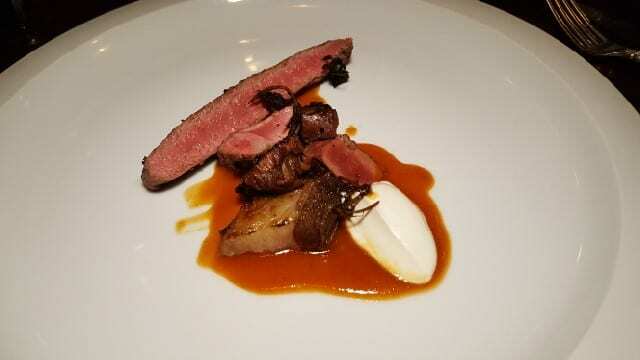 The lamb is tender and flavorful but a few too many innards for my personal liking. 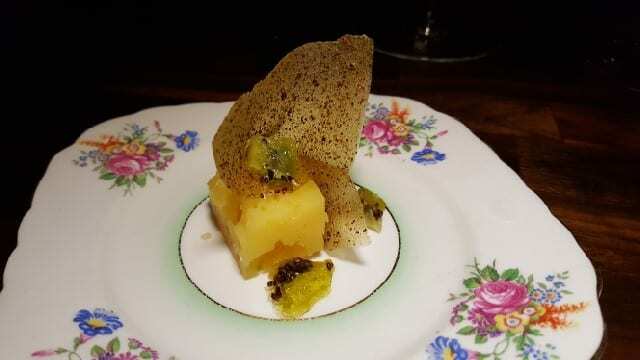 Mahon Reserve – A chunk of mahon cheese is served with a kiwi-soaked lime juice leather, introducing a touch of sweetness as we head into the final courses for the night. 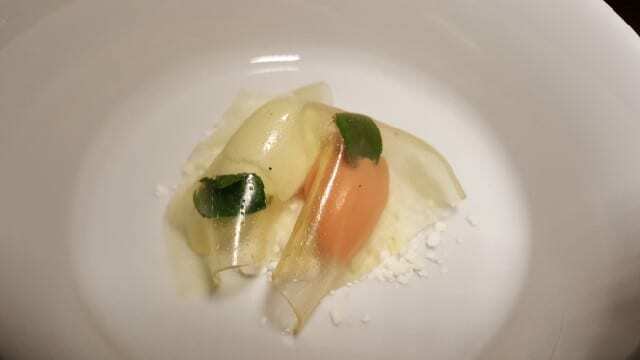 Palate Cleanser – The tart, refreshing bites of guava sorbet and kaffir lime ice cream served under a thin veil of mint, are the perfect palate cleanser. 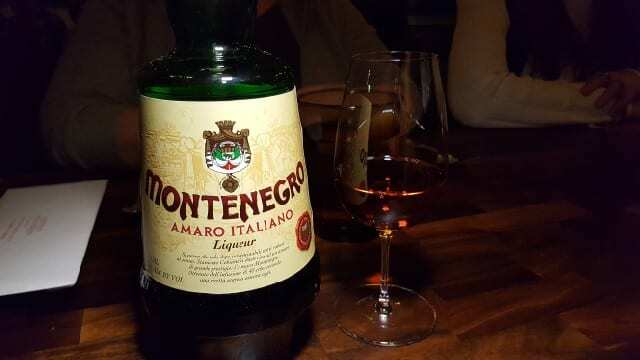 To pair with desert, as well as to finish of the meal, we enjoyed a glass of the Amaro Montenegro, Bologna, Italy, which mixes aromatic and sweet elements with slightly bitter herbal note. 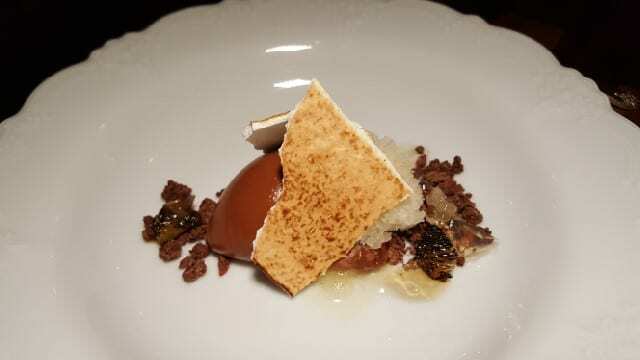 Chocolate – Cinnamon chocolate cremeaux, honey granita, lime torched meringue, mezcal gelee. 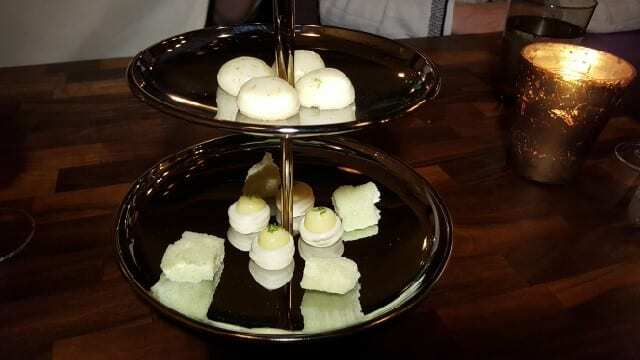 To finish the meal, we enjoyed shortbread cookies with lime glaze, aerated kaffir lime white chocolate and pavlova with lime curd. And we were then sent home with a jar of lime curd to enjoy the next day. 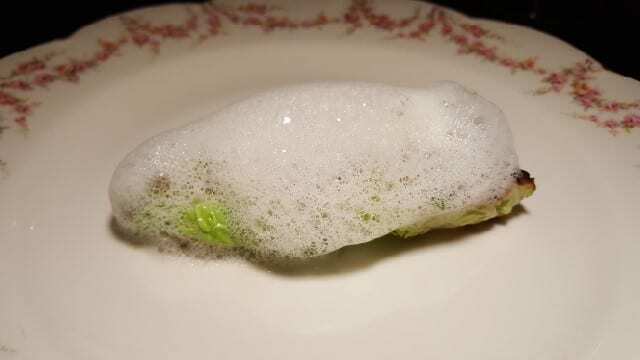 Maude knocked the lime menu out of the park. Even though we did not think it was possible, each course was better than the next and I would be hard pressed to select a favorite dish from all of these. 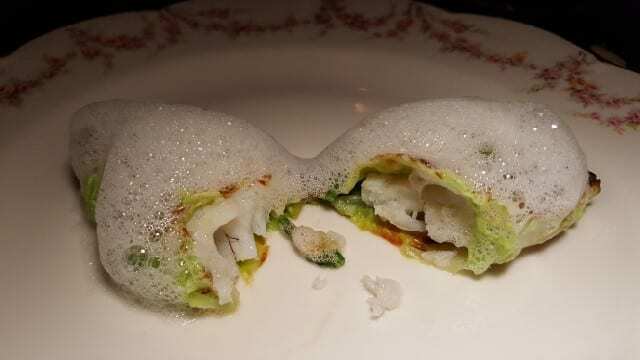 This entry was posted in Food, Wine and tagged food, lime, Maude, Maude Restaurant, seasonal ingredients, Seasonal Menus, tasting menu, Wine, wine pairing by Allison Levine.